YN608RGB video light is a brand new type of LED video light specially designed for live video and beauty selfie. It is made of RGB SMD lamp beads and LED lamp beads, which shows rich full color fill-in light effect.YN608RGB video light adopts extra-large, annular and frameless appearance design. It adopts the annular light source and is equipped with the special soft light panel, the uniformity and softness of the front light-filling is better, unshadowed, which achieves perfect catch-lights effect. Dual power support modes meet all kinds of shooting requirements; Lighting at any angle with YN608RGB helps you to seize catch-lights perfectly. Lighting effect is important for live video and beauty selfie! YONGNUO YN608RGB video light, multiple-point source designed, the lighting effect of which is fine, smooth and soft. The color temperature is accurate and reliable, which presents the stereoscopic sense of face, makes skin color white and glossy, photos, combination with RGB full color fill-in light ensures high image quality of photo and video. 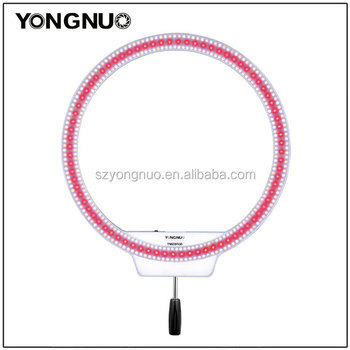 The diameter of YN608 RGB is 50cm. Through blue-light filter, it’s easily to take the charming ring-shaped catch lights. Heighten your eyes, and they are more charming. adopts big chip and high CRI (Color Rendering Index) LED light source, with advantages of low energy consumption, high brightness, providing sufficient and uniform natural light for shooting, shows shadow free aperture effect. YN608 RGB is equipped with special remote controller. With this remote controller, you can true time control the required brightness according to the light effect accurately and swiftly. 1.YN608 RGB supports batteries of NP-F series. When YN600 Air is used outdoors, it’s recommended to use it with NP-F750 lithium batteries to get better camera shooting experience. *Two models of YN608RGB for your choice, white-color version made of 304 lamp beads of 5500K and 80 RGB SMD lamp beads, Bi-color version formed by 152 LED lamp beads with 3200k color temperature, 152 LED lamp beads with 5500k color temperature and 80 RGB SMD lamps.